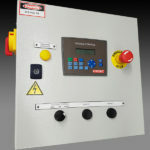 HYDAC is your competent and complete partner for all your fluid technology requirements, including hydraulic systems, electronics, condition monitoring and now, as part of our local capabilities; we make our electrical control panels. These models go from a basic starter for starting an electric pump motor to a complex model for starting an electric pump and cooler motors including options of controlling up to 4 solenoids, locally and remotely. Basic Motor starter – ESS: basic direct-on-line starter for starting electric pump motor on hydraulic power packs. Assembled Motor Starter Panel – ESA: assembled direct-on-line starter box for starting electric pump motor on hydraulic power packs. The ESA has the option of controlling up to two solenoids, locally and remotely. Assembled Motor Starter Panel – ESB: assembled direct-on-line starter box for starting electric pump and cooler motors on hydraulic power packs. The ESB has the option of controlling up to four solenoids, locally and remotely. Assembled Motor Starter Panel – ESC: assembled direct-on-line starter box for starting electric pump and cooler motors on hydraulic power packs. 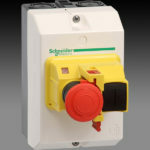 The ESC has the option of controlling up to four solenoids, locally and remotely; it has also a PLC with text display mounted on of the door of the unit. 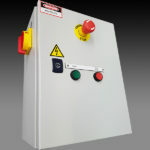 Our electrical control panels have been designed and developed to follow the AS 3000 standard. We also guarantee that each panel is tested prior to dispatch. For more information, email us on info@hydac.com.au or give us a call on 1800 449 322 and trust us for your next project.